Be the first to share your favorite memory, photo or story of Samuel "Sam". This memorial page is dedicated for family, friends and future generations to celebrate the life of their loved one. 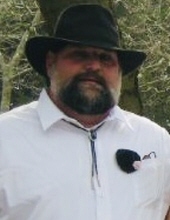 Samuel “Sam” Brown, age 62, of Richlands, VA passed away at his home Tuesday, February 5, 2019. He was born May 7, 1956 in Richlands, VA and was the son of the late Edward and Roberta Thompson Brown. Sam was employed with Jones Petroleum. He was an avid NASCAR Fan and loved fishing and Jesus. He was a member of the Zion Tabernacle Church. In addition to his parents, he was preceded in death by two brothers, Carter and Carl Brown. Survivors include his wife of 41 years, Carol Brown; children, Michall Phillips and wife Leslie of VA Beach, Samantha Brown of Bluefield, WV, John Brown and wife Heather of Richlands, VA, Angela Lowicki and husband Bill of Lebanon, VA; 9 grandchildren, 2 great-grandchildren; one sister, Thelma Cochran of Cedar Bluff, VA; three brothers, Eddie Brown, Barry Brown & wife Linda, and David Brown all of Richlands, VA; several nieces, nephews and his loyal sidekick, Toby also survives. The family will receive friends from 6 – 9 p.m. Thursday, February 7, 2019 at Singleton Funeral Service in Cedar Bluff, VA.
Funeral Services will be conducted at 1 p.m. Friday, February 8 at the Singleton Funeral Service Chapel with Pastor Walter Franklin officiating. Burial will follow at Greenhills Memory Gardens at Claypool Hill, VA. Pallbearers will be family and friends. Honorary Pallbearers will be co-workers of Jones Petroleum. The family of Samuel “Sam” Brown is in the care of Singleton Funeral Service in Cedar Bluff, VA.
To send flowers or a remembrance gift to the family of Samuel "Sam" Matthew Brown, please visit our Tribute Store. "Email Address" would like to share the life celebration of Samuel "Sam" Matthew Brown. Click on the "link" to go to share a favorite memory or leave a condolence message for the family.